London Woodard & Penny Lassiter. “Uncle London” Woodard (1792-November 15, 1870) was one of the most respectable black men of his area and time. Having been married about 1817 to James Bullock Woodard’s Venus, he was purchased by this planter on May 24, 1828, and became his overseer and distiller. London was baptized into the fellowship of the Tosneot Primitive Baptist Church on August 24, 1828, and Venus on August 4, 1838. This good woman died about the end of 1845, leaving several children to mourn her loss. In 1846, he married Penelope Lassiter, daughter of Hardy Lassiter. She had become an indispensable part of the James B. Woodard household after the death of his first wife in 1837. “Aunt Pennie,” a free woman of light color, who worked hard, saved her money, and bought land. On September 18, 1854, she also bought “Uncle London” and made him a free man. He was “liberated to preach” on April 21, 1866, and in the following December Mrs. Elizabeth Farmer gave him one acres upon which he soon erected “London’s Primitive Baptist Church” which is still in existence. From the introduction to Hugh Buckner Johnston, The Woodard Confederate Letters of Wilson County (1977). Photo of London Church taken by Lisa Y. Henderson, May 2013. [Sidenote: Actually, while London Woodard may have lived essentially as a free man after Penny Lassiter’s purchase, there is no evidence that he was in fact emancipated prior to the end of the Civil War. No record of such has been found and, while Penny and their children appear as Lassiters in the 1860 census, he does not. Hi, Leroy! I’m glad you enjoyed the blog entry. There are more about Penny and London that I intend to post in the future. As for descendants, let me check my research notes and get back to you. Take care. — Lisa H.
My question is, Who was his mother & Father? North carolina. Defining point of Edgecombe County and particularly of the town of Tarboro. I’m not sure what you mean. Edgecombe County was formed from Bertie in 1741. The man for whom it was named, Baron Edgcumbe, died in England in 1758. He never lived in Virginia or North Carolina. As I recall, James B. Woodard purchased London in the 1820s and sold him to Penny Lassiter in the 1850s. I doubt there is any way to know who London’s parents were, or even where he was born. Good morning. I too am a descendant of Uncle London, through my great grandfather, Simon Barnes, Sr. 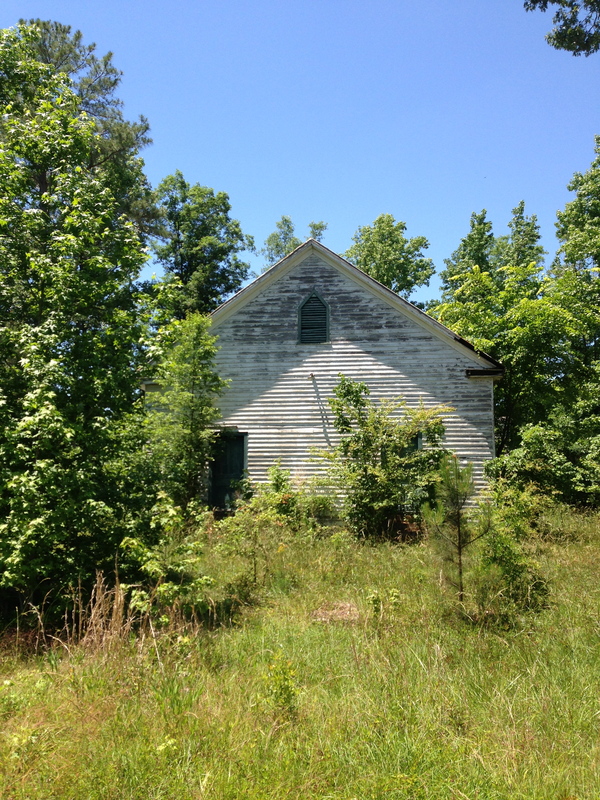 I am just wondering why the church sits neglected? I have visited the site on several occasions and it would be nice if it were maybe restored to its original features. It would be nice indeed, but it would also be costly. It is my understanding that the building is now privately owned by the man who saved it from demolition and moved it from Herring Avenue around the corner to its current location. If that is so, the current congregation of London Church — which is small, not wealthy, and possessed of another building to maintain — has no responsibility for the old church’s upkeep. I was at the site this past summer and estimate that repair would run in the tens of thousands of dollars. Restoration would inevitably cost even more. The church would then require costly regular maintenance to keep water and termites from repeating their depredations. That’s a lot for an unused building — even one with significant cultural and historical value. My Name is Pastor Ray A. Lee a (Woodard) on my Mother’s side. I am the 2nd Great Grandson Of Silas Woodard according to the census of 1870 Wilson County he was born in 1827. I am also related to the Artis families. My 2nd Great Grandfather was from Black Creek City and Wilson county, North Carolina. Could this lineage be connected to London and Venus Woodard ? My Name is Leroy Barnes, born and raised in Wilson, North Carolina, USA. I am a descendant from of London Woodard (1791)/Barnes families. My Grandmother name was Lena Woodard Barnes/Henry Barnes. What can you tell about your Lee/Woodard and Barnesfamily? Ancestry.com/The Elder London Woodard Family Tree.